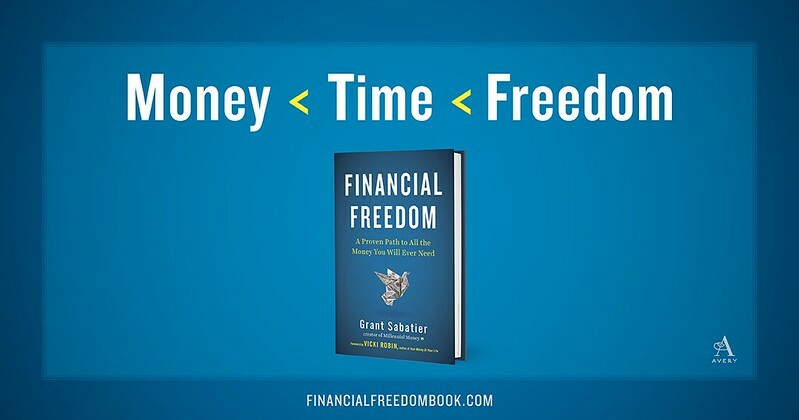 Last October, I had a chance to read an advance copy of Grant Sabatier‘s new book, Financial Freedom, which was just released this morning. I liked it. I loved parts of it. In fact, the second chapter of Financial Freedom inspired my article about how time is more valuable than money. If some ninety-year-old rich dude offered you $100 million to trade places with him, would you do it? Of course not. Why? Because time is more valuable than money. The average person has approximately 25,000 days to live in their adult life. If you’re reading this, you likely need to trade your time for money in order to live a life that is safe, healthy, and happy. But if you didn’t have to work to make money, you’d be able to spend that time however you wanted. No one cares about your time as much as you do. People will try to take your time and fill it up with meetings and calls and more meetings. But it’s your time. Your only time. Financial Freedom is designed to help you make the most of it. Make money buy time. My goal is to help you retire as early as possible. When I say retire, I don’t mean that you'll never work again, only that you’ll have enough money so that you never have to work again. This is complete financial freedom — the ability to do whatever you want with your time. I don’t ever plan to retire in the traditional sense of the word, but you could say that I’m “retired” now because I have enough money and freedom to spend my time doing whatever I want. I no longer have to work for money, but I still enjoy making money, and it’s attached to many of the things I enjoy doing. I love working and challenging myself and hopefully always will, so checking out to a life of leisure just isn’t my vibe. If you want to “retire” sooner rather than later, you need to rethink everything you’ve been taught about retirement and probably most of what you’ve been taught about money. As a society, we have collectively adopted one approach to retiring: get a job, set aside a certain portion of your income in a 401(k) or other retirement account, and in 40+ years you’ll have enough money saved that you can stop working for good. This approach is designed to get you to retire in your sixties or seventies, which explains why pretty much every advertisement about retirement shows silver-haired grandmas and grandpas (typically on a golf course or walking along the beach). It doesn’t work for most people. You end up spending the most valuable years of your life working for money. It’s not designed to help you “retire” as quickly as possible. The first major problem with traditional retirement advice is that even if you follow it perfectly (and most people usually don’t), you still might not have enough to live on when you are in your sixties. The popular advice to save 5% to 10% of your income isn't enough. You should be saving as much money as early and often as you can. If you want to be sure you'll be able to retire at 65, you need to start (and keep) saving at least 20% of your income from the age of 30.